I've been working on the Halloween book today. The title of the book is going to be Tis Halloween. The photography is half-way done. I've been trying to find some new ways to show these stockings. Something quirky and fun. On the quilt front. We will have this new pattern in our warehouse next Friday. You should find this at your local quilt shop in a couple of weeks. We will begin shipping out the pattern next Friday... I'm sorry that Barb and I can't sell it retail...we only sell wholesale to shops and distributors. Barb wanted to honor her grandmother's year of birth...so that's why the year is attached to the title. (Not to be confused with Barb's year of birth hahahaha....I must be slap happy from all of the photography and all the technical writing I have been doing. I'm beginning to lose it. (Sorry Barb!) Really Barb is a bit younger than me anyway. She just aged another year the end of July. Preheat the oven to 400 degrees. Lightly butter the muffin cups. Fold the flour mixture into the "wet" ingredients. Do not overmix. Cool before removing them from the pan. This one is from Susie. She writes, "I have been working on your little baskets quilt from When the Cold Wind Blows. I have 176 baskets hand appliqued. That is a great quilt in your book and I know a number of quilt buddies working on the baskets. I am making mine scrappy and multi-colored on shirtings background. Appliqueing the baskets is very relaxing for me and I haven't tired of them yet." The next one is from Valérie and she writes, "
I thought you would like seeing one of your summer charts finished on the first day of my summer break. I have customized the text so that it reflects how much the pattern reminds me of previous summers spent beneath the sunlit sky of Andalucia, on the Atlantic coast, not far from the Doñana National Park, home to migratory birds. 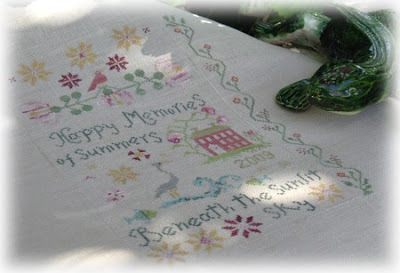 I am not going away this year, but vacationing at home and it was nice remembering summers past while stitching. Congratulations on your work - always beautiful. Until tomorrow dear ones! Think it's time for another contest. I love your blog and look forward to reading it everyday. I've just started doing blackbird designs and I love them. My question is, I'm working on the small token pins and needles pincushion. I was wondering if you had a 7 stitch tall alphabet you can share so I can put my initials on it. Thanks alot. The Halloween photo shoot looks really spooky, it's whetted my appetite and come just at the time I'm looking for a design for a Halloween exchange I've entered. Can't wait to see more!!! The quilt is glorious and having Barb's grandmother's date sets the imagination racing. People will be thinking: now I wonder what happened at Halloween in 1904...hmmm! I love your 1904 pattern, very cute. I do enjoy your blog very much. That little sneak peek has me salivating for the Halloween stockings! I can't wait. I love the fork, and I love the beaded hanger. I am looking so forward to this release. I also LOVE that quilt. I am not a quilter (yet), but I may have to talk my mom into making that one for me. LOVE IT! All of your hard work with photography paid off nicely as the photo of the Halloween quilt is wonderful. Never mind that the quilt is drop dead gorgeous!!! I too am smitten with the applique basket from WTCWB book. Basket blocks are my all time fav and I was smitten with it so much that I learned how to needle-turn, previously a 4-letter word in my vocab. Here in the Chicago area, there are loads of us addicted to this little block. We meet to sew them together, trade fabrics, announce the finished block count and have a good time. I am hopelessly & happily addicted. I want to thank you both for all that you do to inspire us with your cross stitch and quilt designs, blog, decorating, cooking and sharing your lives! Could you just share how you manage to do it all???? Oh I so have to get this book!! I love Halloween and I have a ton of halloween fabric!! MUST HAVE THIS QUILT :o) I LOVE it! Absolutely love it! Can't wait to get the book!! Love the quilt! Love your Halloween Quilt...I'll have to stop by the LQS and give them a nudge to order it! I am always so surprised by the amount of work you do every day and that we can read you and share with you so nice moments as a book issue or new pictures of your projects or good receipes. Thank you ! The quilt is gorgeous! It would be lovely to have for Halloween. I can't wait till the Halloween stockings come out, I love Halloween designs and your other stockings are so beautiful. Arrrgh... I can't wait! 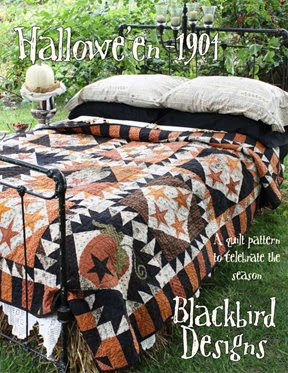 Halloween is my favorite holiday and my birthday so I love the look of the quilt on the cover. Can't wait to see the whole book. give the muffin recipe! I can't wait to try them with a cup of coffee! We are all looking forward to your new designs (love the bent fork!). I love your fork stocking holder! You come up with the most clever and wonderful ideas, and I really can't wait to see this booklet! After a long day of unpacking at my sisters new house, I can't tell you how much I'm enjoying your blog. I have stitched almost all of the previous stockings and can't wait for the Halloween book. Pat, Anne and Bendi are putting the linen and book together for me and 3 of my friends so we can all stitch together. We have a Halloween thing going. Keep up the beautiful work. I also may have to learn to quilt to make the Halloween quilt. I love the new quilt, it is gorgeous. The humidity is going down this week, so maybe I can get some quilting done. The recipe I use for the banana pineapple bread came from cooks.com. I have a special diet, so I modified it for my needs. Most of the recipes for the bread are the same except for nuts in some. I just love how the pineapple gives it an extra taste. What a great Halloween quilt! And thanks for sharing the recipe too! 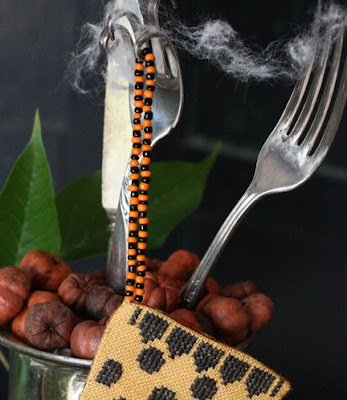 I love the sneak peek of the Halloween stockings and that beaded hanger is too cute! I can hardly wait for this book to be ready! I've got to try these muffins too...thanks so much for the recipe! PS Keep us posted about Ms. Pumpkin and the new guy with the wicked grin, LOL!!! Wonderful! I love the bent fork idea. I went to a street fair in July and bought an angel figure that was made out of bent forks. You should have seen the booth -- they'd made all sorts of things from just bending forks, so cool! oh my, I love that halloween quilt! I recieved my "Halloween 1904" pattern in the mail today and I am just tickled pink (or would that be orange?) I love it! that halloween quilt is the coolest ever!